These time code receivers may be used to automatically synchronise compatible Wharton network time servers, certain clocks and time zone clocks to GPS or GLONASS satellite time transmissions and DCF77 or MSF radio time code signals, depending on model. This provides a means to synchronise the 5000 Series network time servers, 4000E and 4000NE series clocks and calendar clocks and 4700N and 4700NIL series time zone clocks to GPS. GPS is a system of more than 30 satellites, which transmit highly accurate, real-time, worldwide, navigation information at 1575.42 MHz that a GPS receiver can use to identify its position, together with a precise Coordinated Universal Time (UTC). The GPS system was developed by the US government initially for military use and is now available for unlimited commercial access. It is useful for broadcast locations, out of range of MSF or DCF77 radio code transmissions, where international time accuracy is required. The receiver is housed in a weatherproof, IP65-rated case containing both the active antenna module and the receiver/decoder interface. Timing accuracy of 4000 series clocks is +/-5ms of UTC when the clock is synchronised via 488.HS4-GPS (E and NE clock versions only). If an external mounting point is required, the receiver may be located up to 200 metres from the clock. Included accessories: The receiver is supplied with 25 metres of four-core 7/0.2 (0.22mm sq.) screened cable. (It can be supplied with 100m cable reel as an extra cost option, please contact Sales). This is used to automatically synchronise 5000 Series network time servers, 4000E and 4000NE Series clocks, calendar clocks and 4700N and 4700NIL Series time zone clocks to GLONASS. GLONASS is satellite navigation system with more than 20 satellites. It was developed by the Russian government initially for military use and is now available for unlimited commercial access. The receiver is housed in a weatherproof, IP65-rated case containing both the active antenna module and the receiver/decoder interface. Timing accuracy of 4000 series clocks is +/-5ms of UTC when the clock is synchronised via the 488.HS3-GLONASS receiver (E and NE clock versions only). 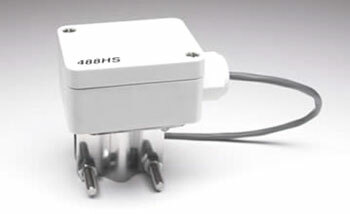 If an external mounting point is required, the receivers may be located up to 200 metres from the clock. 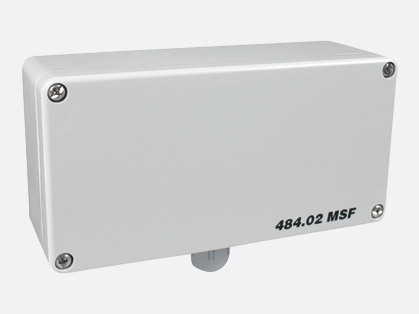 This provides automatic synchronisation for 5000 Series network time servers, 4000E and 4000NE Series clocks and calendar clocks and 4700N and 4700NIL Series time zone clocks to MSF time code. The MSF time code is transmitted from Cumbria, UK. It is transmitted at 60kHz and is referenced to the Caesium Beam Oscillator at the National Physical Laboratory. The receiver is housed in a compact weatherproof case. In many locations it will operate within the building. If an external mounting point is required, the receiver may be located up to 200 metres from the clock. Timing accuracy of 4000 series clocks is +/-20ms of UTC when synchronised via the 484.02 (E, NE and time zone clock versions only). Included accessories: The 484.02 radio receiver is supplied with a 5m cable. The 484.03 provides automatic synchronisation to DCF77 for 5000 Series network time servers, 4000E and 4000NE Series clocks, calendar clocks and 4700N and 4700NIL Series time zone clocks. The DCF77 time code is transmitted from a radio station located at Mainflingen near Frankfurt, West Germany. It is transmitted at 77.5kHz and is derived from an atomic clock at the Physics Institute of Brunswick. The receiver is housed in a compact weatherproof case. In many locations it will operate within the building. If an external mounting point is required, the receiver may be located up to 200 metres from the clock. Timing accuracy of 4000 series clocks is +/-20ms of UTC when synchronised via the 484.03 (E and NE clock versions only). Included accessories: The 484.03 radio receiver is supplied with a 5m cable. All Wharton products are available from Canford. If the item required is not in this selection, please contact Sales for assistance.